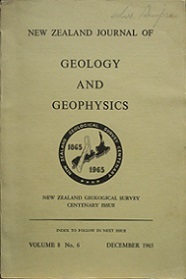 Published by the NZ Geological Survey, Centenary Issue, in 1966,1,288 pages. Introduced with words from the Hon. B E Talboys, Minister of Science and Dr W M Hamilton, Director-General, DSIR.